By FFWPU USA: On December 7, 2015 the True Family Values Ministry concluded its 20th anniversary three-day celebratory event with a banquet and conference in New York City’s New Yorker Hotel. 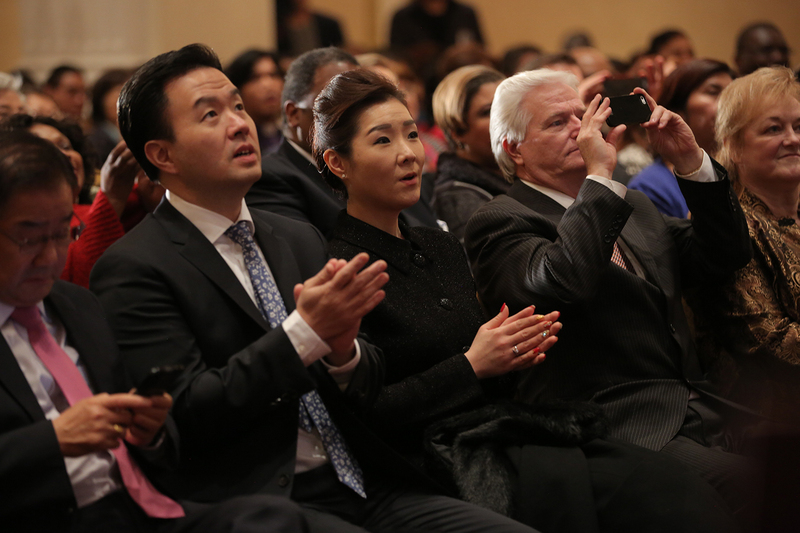 After commemorating the ministry’s noteworthy milestone in Chicago this weekend, several of its leaders flew straight to New York to mark and finish the program and start a brand new decade of the True Family Value Ministry, a decade of plowing through these troubled times which the world faces today. The True Family Values Ministry aims to stay relevant according to the times, and what more fitting a place than New York City—the hub of all cultures, faiths, and worldly challenges—to close out the 20th anniversary conference for a ministry that is meant to actively pursue interfaith peace dialogue? Also significant was the opportunity to welcome International President of FFWPU, Sun Jin Moon, to represent True Parents, the founders of the True Family Values Ministry. 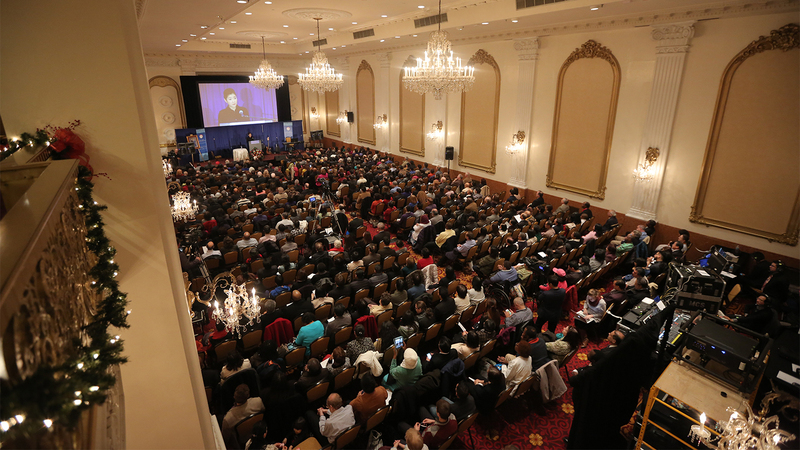 Over 500 clergy, ministers and local Unificationists from New York, New Jersey, Connecticut and Washington, D.C. were in attendance on Monday evening. With Christmas drawing near, the event exuded a festive spirit, complete with entertainment from Apple Heaven and several musical offerings from participating clergy. Upon arrival, everyone gave an open donation to support the event. Classic jazzy Christmas tunes filled the air as a group of 100 clergy members entered the Crystal Ballroom where a light dinner banquet was served. Dr. Simone Mason gave an invocation to bless the evening, thanking Heavenly Parent for the insight of True Parents’ lives that brought everyone together on this night. A musical offering of the Christmas carol, “O Come All Ye Faithful” was performed by three participants, followed by the presentation of two videos. The first, “The Power of True Love,” told the story of ACLC, sponsor of the True Family Values Ministry and an organization that has been working for decades to tear down the walls of race and denomination and make Jesus’s teachings on marriage a reality, inspired by the vision of True Parents and the Marriage Blessing Movement. The second video, introduced by National Executive Director of ACLC Rev. Tom Cutts, highlighted the recent Marriage Blessing that took place at the Unity Baptist Church in Las Vegas, sharing the Blessing with over 50 couples. The dinner finished with a shared congregational hymn, “Angels We Have Heard on High,” and then the group relocated to the Grand Ballroom along with over 400 arriving guests to greet Sun Jin Moon who had words to share with them on behalf of True Mother. Rev. Stallings led a praise and worship session to open the evening in song. Rev. Edner Pierre Louis, District Pastor of FFWPU’s New York region, emceed the main program and greeted the group, then welcomed Rev. Jesse Edwards, ____, to give an opening prayer. After scripture readings from the Gospel of Luke by Mr. Franklin Fountain, and from the Cham Bumo Gyeong by FFWPU Vice President Mari Curry, the video, “20 Years of True Family Values Ministry” was shown, highlighting the many landmarks of the ministry including personal testimonies; historical events; breakthroughs by its founders, True Father and True Mother; and True Mother’s current work with the ministry leading up to this year’s Awards Banquet in Chicago. Opera singer Ms. Jamie Peterson then graced the audience with a beautiful performance of songs in the spirit of Christmas, including “O Holy Night” and an operatic rendition of “He’s Got the Whole World in His Hands,” bringing everyone to reflect on the unwavering support of our Heavenly Parent in the continuous work to heal the nation through healing families. Rev. Sulanch Lewis Rose, Pastor of the Little Rock Zion International Deliverance Ministries and Co-President of ACLC, then took the stage and gave congratulatory remarks. “The opening words of Psalms, ‘We have come this far by fate,’ is so fitting for this occasion,” she began. “We will continue to forge ahead because there is a bright light that is guiding us on this journey. True Mother defines stability, excellence, and faithfulness to God. On this our 20th anniversary it is a wonderful occasion in this providential role to restore family values through loving each other, with our True Parents guiding us along the path. Dr. Ki Hoon Kim, Continental Chair of FFWPU North America and Co-Chair of ACLC, then welcomed the group and shared an introductory message. “America is not just founded by the Founding Fathers,” he said. “God prepared this country for the last 2,000 years after Jesus, so we are product of God’s 2,000-year providence of restoration. 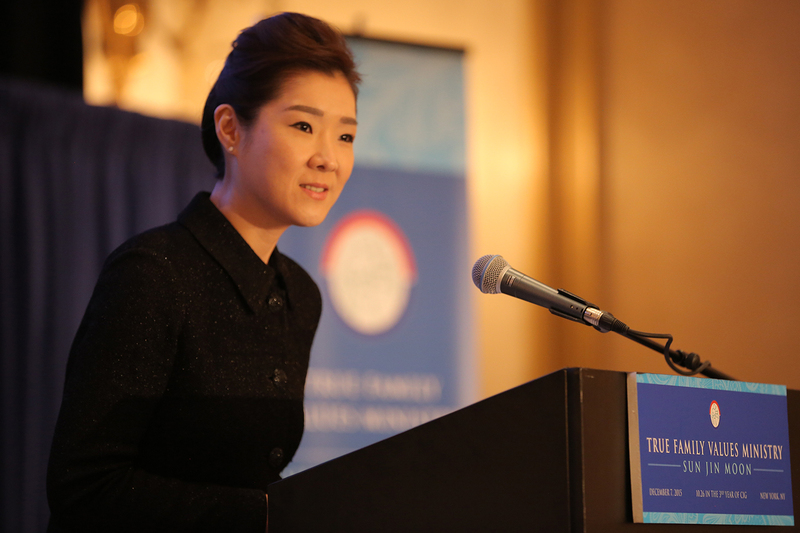 The True Family Values Address was given by Sun Jin Moon, representing True Mother and sharing her message. Apple Heaven, a musical band made up of members of True Mother’s security team, then took the stage donned in holiday-green suits and closed the night in music and dance, taking the audience by pleasant surprise when they included a selection of American songs such as, “God Bless America,” “Country Roads” and “You Are My Sunshine,” which moved everyone to clap and sing along. On this third day of the scheduled anniversary events, it became evident that the power of the True Family Values Ministry lies in what its people are willing to do to propel and inspire change in this world. If people are willing to fly across several states in three days to celebrate 20 years of this successful movement for peace, imagine how quickly people will want to move in the next decade. The weekend program in Chicago followed by this conference in New York were marked with interfaith dialogue and messages of spreading hope and love, of striving for God’s ideal of creation, and of putting down our swords and picking up our plowshares to heal this ailing world. Among the many projects built by True Parents, ACLC, notably through the True Family Values Ministry, is one that is visibly growing each year. This year the ministry saw unprecedentedly high involvement in its annual program, with over 700 people attending in Chicago from eight states in the surrounding area, and an additional 500 in New York. A large number of young people were a part of the events as well. The ministry hopes to spread not only to each region but each generation as it spreads its noble, revolutionary cause around the world. Do you want to be a peacemaker? This is the era to decide, and how you’re going to do it. To support or get involved, check out the ACLC website today.